One of the biggest challenges facing sports game developers is adding new game mechanics to keep the game fresh while moving towards greater control and realism. The goal is to do all that while keeping the game accessible for the batch of players experiencing the series for the first time. Anyone who has had a friend who wanted to play a friendly head-to-head matchup but has never played the game knows the struggle. “L2 is the precision modifier,” you try to explain. “There are approximately 42 different skill-move combos you can pull off with it.” Meanwhile, your friend accidentally laterals the ball back to no one in particular on an HB Dive play. Skills Trainer is an obvious starting point for those new to Madden. The feature is smartly introduced shortly after the opening Rams-Redskins sequence. Each session is broken up into two stages: the tutorial, where the control or concept is introduced, and a drill, where the newly acquired knowledge is put to the test at game speed in a realistic situation. It’s teaching 101, but the structure works well, reinforcing the lesson and building the player’s confidence. Skills Trainer covers all of the usual suspects: basics such as player movement, passing, tackling and kicking. 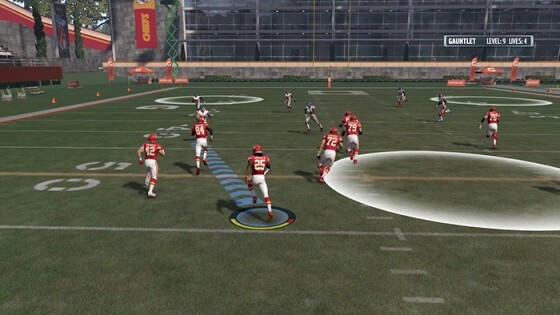 It also focuses on advanced skills like ball-carrier moves, pre-play adjustments and hot routes. But the most impressive — and surprising — aspect of the feature are the tutorials focused on explaining pass coverage, run blocking and passing concepts that form the backbone of how coaches put together real-life plays and game plans. Being a mid-level football fan myself, and never having played beyond a middle school flag football league, I’ll admit I learned a lot about Stick reads, Soft Squat zones and Trap runs. These were previously just meaningless play names to me. It’s great to see Madden advance to a game where even folks who have been watching the NFL for their whole life can learn something new and see that represented accurately in the game. It speaks to the direction the current development team has the franchise going, and there’s a lot to like about it. Once a player completes the Skills Trainer sessions, there’s some more practice to be had in The Gauntlet, which throws you into increasingly more difficult challenges using the skills and concepts learned through Skills Trainer. There’s even some goofy challenges that are more fun than they should be, like kicking through hurricane-force winds and controlling a Honey-I-Shrunk-the-Kids-sized player to the end zone. 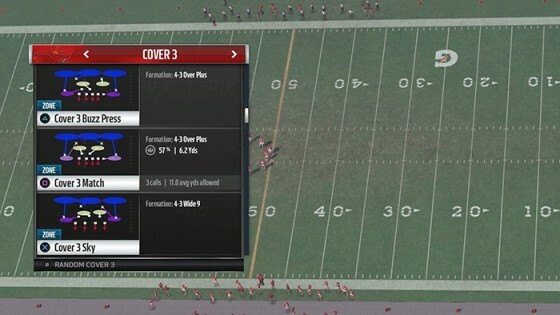 When you’re finally comfortable with the controls and concepts Madden has to offer, standard Open Practice mode has some great options that turn it from a throwaway mode to a powerful tool to elevate your game. A small but important addition this year is the ability not just to select a random play, but drill down with any of the play-call filters available and select a random play from that subset. So for example, if I wanted to work on my screen plays and see what screens work best against Cover 3 defenses, I could select [Play Type: Screen Pass – Random Screen Pass] for offense and [Concept: Cover 3 – Random Cover 3] for defense. Combined with the ability to spot the ball anywhere on the field, Open Practice gives players a chance to work on situational football just like real coaches and teams do. 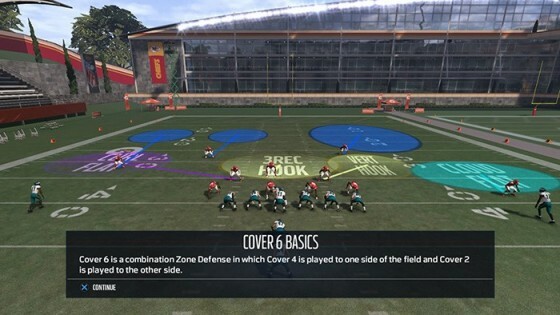 Added together, the tutorial and training features in Madden have no equal. NBA 2K’s “2KU” has been rightfully panned for devoting resources to all of the wrong things. Sure, they got Coach K to lay down some audio tracks, but there is no in-depth breakdown of the dizzying array of offensive and defensive strategies available in the game, and worse, no way to learn and practice the extremely deep shooting and dribbling controls. FIFA has skill games, which do a good enough job at demonstrating the controls, but don’t take that extra step in teaching the strategy behind those moves or other strategic elements such as formations. Baseball has less tactical ground to cover in tutorials than other sports, but MLB The Show does perhaps the second-best job with giving players the training tools they need to succeed. So whether you are just playing Madden for the first time or you’ve been slinging the virtual pigskin since Madden first debuted in 1988, the tools for practicing in Madden 17 are excellent and worth a look.